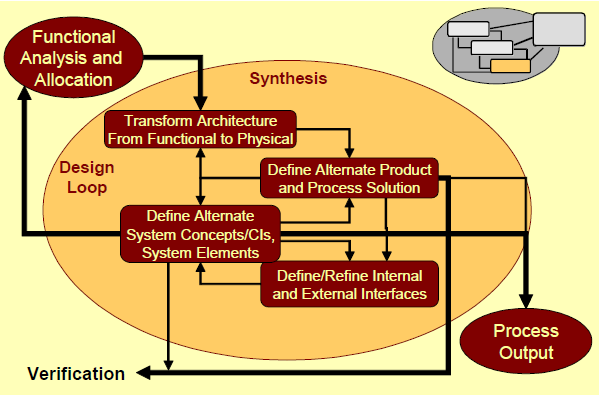 Design Synthesis is the process of taken the functional architecture developed in the Functional Analysis and Allocation step and decomposing those functions into a Physical Architecture (a set of product, system, and/or software elements) that satisfy system required functions. Synthesis is the process whereby the Functional Architectures and their associated requirements are translated into physical architectures and one or more physical sets of hardware, software and personnel solutions. It is the output end of the Design Loop. As the designs are formulated, their characteristics are compared to the original requirements, developed at the beginning of the process, to verify the fit. The output of this activity is a set of analysis-verified specifications which describe a balanced, integrated system meeting the requirements, and a database which documents the process and rationale used to establish these specifications. All supporting information is documented in a database.